The North American AJ Savage (later A-2 Savage) was a carrier-based bomber aircraft built for the United States Navy by North American Aviation. 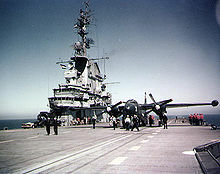 The original contract was awarded in June 1946, first flight 3 July 1948, and the plane entered service in 1949. The AJ Savage was a large composite-powered carrier-borne Attack Bomber designed to deliver nuclear ordnance. It also performed photo reconnaissance duties and later on was used as an aerial refuelling platform. The North American AJ-1/2 and AJ-1/2P Savage aircraft were in a number of USN Heavy Attack Composite squadrons from 1948-1956, as well as in several Photographic Reconnaissance squadrons. The Heavy Attack versions were the first nuclear bomb carrying bombers able to be launched from and recovered on aircraft carriers. The date of its design inception was a time where the US Navy was faced with procuring the nascent jet engine, while still having to rely upon the simple yet well proven reciprocating engine. Jets at this time were unreliable and used large quantities of fuel; however, once they were developed, they produced performance that no piston engine could ever provide. A compromise was made to include in the Savage two Pratt & Whitney R-2800 piston engines, with a large turbocharger fitted inside each engine nacelle. This combination made it possible for the R-2800 engines to produce rated power (2,500 hp/1,864 kW) up to 42,000 ft (12,802 m) altitude. An Allison J33 turbojet was fitted in the rear fuselage. Interestingly, both engine types used the same fuel. 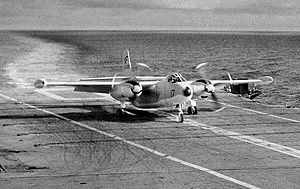 The piston-turbojet arrangement was intended to give added power on take-off and extra dash speed while in combat. At high altitude, this 'boxy' looking (but aerodynamically very clean) airplane was remarkably fast - more than 460 mph (740 km/h), when the jets of that era were not very much faster. The AJ-2 first flew on 19 February 1953 and had uprated engines and a taller vertical stabilizer and non-dihedral tailplane. XAJ-1 Prototype with two 2,300 hp (1,715 kW) Pratt & Whitney R-2800-44 radial engines and one Allison J33-A-19 turbojet, three built. AJ-1 (A-2A) Initial production version with two 2,400 hp (1,790 kW) R-2800-44W radial engines and one J33-A-10 turbojet, 55 built, survivors re-designated A-2A in 1962. AJ-2 (A-2B) Updated production version with two 2,500 hp (1,864 kW) R-2800-48 radial engines and one J33-A-10, taller fin slightly longer fuselage and increased fuel capacity, 55 built, survivors re-designated A-2B in 1962. AJ-2P Photo-reconnaissance version of the AJ-2 with array of cameras, 30 built. A-2B Savage, BuNo 130418, is displayed at the National Museum of Naval Aviation at Naval Air Station Pensacola in Pensacola, Florida. Of 143 examples built, it is the only surviving airframe.